Hamsters are small rodents who are part of the subfamily Cricetinae in scientific classification. There are about two dozen hamster species, but only five of them are kept as family pets. The most popular hamster kept in captivity as a pet is the Syrian or Golden hamster (Mesocricetus auratus). Depending on the species, hamsters vary in size. The European hamster is the largest hamster species and can grow to be 34 cms (13.4 inches) in length. As the name suggests, the smallest hamster species is the dwarf hamster which tops out at 9-10 cms (3.5 -4 inches). There are many animal superstitions, but hamsters don’t seem to be involved in such beliefs. But there was a huge demand for hamsters in China during the Year of the Rat. Hamsters have stocky little bodies with short stubby legs and small ears. Most hamsters have tails that are so small they can be hard to see. The Chinese hamster is the only hamster with long tail relative to its body size. Hamsters have large cheek pouches where they can store large amounts of food. When their cheek pouches are full, it can make a hamster’s head double in size. While it looks comical, filling their cheeks with food is a hamster survival technique. Hamsters use their cheek pouches to transport food to their burrows to store and eat later. Hamsters are proficient at digging and will make elaborate burrows. Hamsters can make burrows that are over a half-metre deep with more than one entrance. Hamster burrows may also have more than one room, with sections reserved for things like storing food or nesting. Wild hamsters will use their underground burrows to hide from predators during the day. Those rumours you heard about hamster mothers sometimes killing and eating their young are true. There are several reasons that could prompt a hamster mom to kill and eat her babies. The stress and fear in raising babies, especially with a new hamster mom, may prompt a hamster to kill and eat her pups. If humans handle hamster pups too much, they could leave their scent on the babies, confusing the mother. If a hamster mom can’t relate to her pups by their scent, she may reject them and then kill them. A hamster mom may kill and eat her pups if she thinks there aren’t enough food and water resources available for them. Depending on the hamster species, they can live an average of between 2 – 3 years in captivity. This is the second time we have featured hamsters as our Animal of the Month. 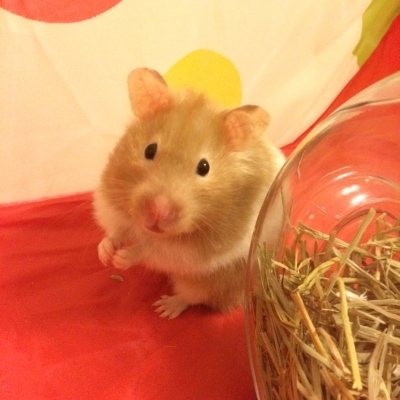 Check out our blog post from December 2014 to see our tweets about hamsters the first time!